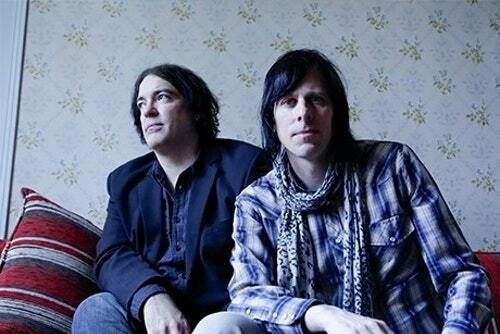 The Posies are celebrating their 30th Anniversary in various ways this year. Some of their classic albums, like Dear 23, Amazing Disgrace, and Frosting On The Beater, are available in deluxe editions via the band’s PledgeMusic site, and the full band will embark on a tour this spring. In the meantime, founding members singer-guitarist Jon Auer and singer-guitarist Ken Stringfellow are hitting the City Winery circuit as a duo. The constant tuning definitely slowed things down, but as for the rest of the non-music fare, it was pretty entertaining. Auer and Stringfellow engaged in comic bickering, almost as if their 30th anniversary marked a marriage rather than a musical partnership. “I swear to God if you make that face one more time . . . ” Stringfellow gazed out at City Winery’s restaurant/rock club arrangement of chairs and long tables, and said it felt like they were performing in the dining hall at Hogwarts. The songs—when they came—were stripped down but expertly rendered selections from The Posies’ three-decade repertoire. Auer and Stringfellow harmonized perfectly throughout the concert and each proved to be a strong vocalist when singing individually. It was easy to imagine people unfamiliar with the songs still being impressed. Easy because even those of us who are loyal fans might not have known all the deep tracks being performed. The more familiar fare ranged from the catchy “I May Hate You Sometimes” from The Posies’ 1988 debut Failure to the more involved “Squirrel Vs. Snake” from the almost secretly released Solid States in 2016. Other highlights included “Golden Blunders,” “Solar Sister,” “Flavor Of The Month,” “Believe In Something Other (Than Yourself),” “My Big Mouth,” and “20 Questions.” Inviting Chicago-based singer-songwriter Shelley Miller onstage to join in on “The Glitter Prize” (after she joked about not expecting a comedy show) added to the show’s good time, community feel. Following an encore that included a gorgeous rendition of “Suddenly Mary,” Auer and Stringfellow came out to a merchandise table in the lobby. Even after a two and a half hour show, there was still time to bond with their fans.